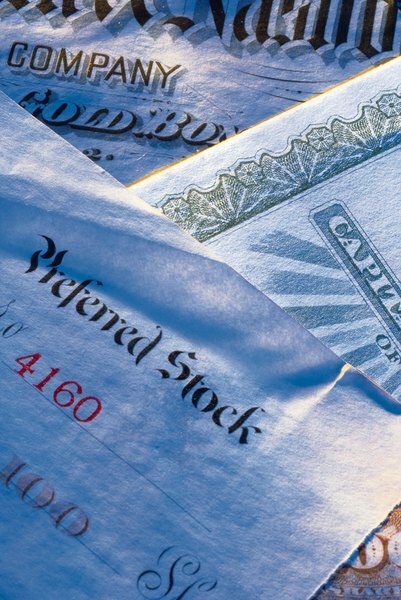 Preferred stock might be a useful addition to your investment portfolio. Preferred stock combines some of the features of common stock and high-yield bonds -- investors often call it a hybrid security. Like common stock, preferred stock pays dividends. However, the dividend yields of preferred stock more closely match those of high-yield bonds, and both compete for income-oriented investors. Although preferred shares have some special benefits, you might prefer other investments. Corporations must pay dividends on all preferred shares before paying dividends on common shares. A cumulative preferred stock must also repay any missed dividends before common stock dividends resume. If a corporation goes bankrupt and is liquidated, the money from its assets first pays off the government and bondholders. The holders of preferred shares are next in line. Pulling up the rear are the common stock holders, who might find little or no cash left for them. Holders of preferred shares generally have no corporate voting rights. Most preferred stock has no maturity date -- you can hold the shares forever. In the five years ending Dec. 31, 2012, the returns on preferred shares beat those of common stocks but trailed the returns on high-yield bonds. The iShares U.S. Preferred Stock Index had an average annualized return of 7.74 percent over the period. In that same period, the Standard & Poor's 500 index of large common stocks earned 1.66 percent, and the Barclays High Yield Index grew by 10.33 percent, both annualized. This five-year period was uncommonly volatile, and other periods might show different results. Corporations must make bond interest payments; if an issuer defaults on an interest payment, bondholders can gain control of the company and sell it off to recover their money. But corporations can suspend dividend payments without causing a default. Common stockholders might vote to change the management of a firm that suspends dividends, but preferred shareholders have no voting rights. Preferred dividends can qualify for lower tax rates, whereas on bond interest you pay your marginal tax rate. Corporations sometimes find the preferred shares of other corporations a good investment because they receive tax breaks on dividends from these other corporations' preferred stock. The size of this "dividends-received deduction" depends on how much of the dividend-paying corporation is owned by the dividend-receiving corporation. Preferred stock might be a good investment for people seeking steady income. It shells out higher dividends than does common stock, on a par with high-yield bond interest. Bonds also fork over steady income, and you can sue an issuer that defaults on its bonds. Preferred shares are not a good choice for investors seeking capital gains, because their dividends don't increase when the issuer increases earnings. You might prefer dividends to interest to save tax money, or you might instead choose to shelter your investment income from taxes through an individual retirement account. USA Today: Ask Matt: What's the Allure of Preferred Stock?